The "Miracle on Maxwell Mesa"
On a cool but cloudless evening last July, a select handful of Scouters from all over the country gathered outside the Rayado messhall at the Philmont Scout Ranch and Explorer Base. As each man cooked a steak over the glowing coals, the conversation mostly was about the weather: When would the drought plaguing New Mexico end? Did the ranch have enough drinking water to finish the season? How long could Philmont's famed buffalo herd survive without rain? Inside the mess hall moved the Scouters. The small talk continued as they consumed the steaks, roasting ears and watermelon. A casual observer couldn't have guessed from the conversation that the Scouters--most wore Wood Badge beads, significant of the thorough Wood Badge training course--were at Rayado to assess changes in junior leader training. Every one of the volunteers had spent some time observing a different patrol in one of the four training troops camped on Maxwell Mesa. Now they were ready to report their findings to Jack C. Keeton, director of the Scouting Division of the Boy Scouts of America. By the time the sun had slid behind that famous Philmont landmark, the Tooth of Time, the assessment session was in full swing. One by one the men--many were Scoutmasters--stood up to testify that only rarely had they seen such outstanding patrols as those in the training troops camped in the hills flanking Rayado Creek. The praise was so lavish that I began to wonder if maybe the camp on that dusty New Mexico mesa wasn't the greatest thing that ever happened to boys since Brownsea Isle. Scouting Magazine had sent me to Rayado to report on Philmont's 1971 junior leader training because, to be completely honest, there was talk that something big was going on. Near the end of the Scouters' assessment meeting, one of them stood up. "What's going on up there," he said, jerking his thumb toward the hills, "is terrific. The patrols and troops are operating more smoothly than I thought possible. Those kids have--well, they have something like the Wood Badge spirit!" Coming from a man who wore the beads himself, the comment meant to me that something akin to a Scouting miracle was unfolding on Maxwell Mesa. Although I didn't know it as I sat there, my personal observations over the next few days would convince me that I was witnessing a profound improvement in junior leader training--refinements that will change and improve an already good Scouting program. Suddenly another man stood up. "What those Scouts really have," he said, "is true Scouting spirit"--and in the days to follow I was to reflect on these words over and over. None of the five, 12-day National Junior Leader Instructor Training camps held at Philmont last summer got off to a magnificent start. Upon arrival at Rayado, the Scouts were formed into arbitrary patrols. A young staff member wearing a red beret guided each patrol around. This guide did not enter into the patrol as a patrol member; he simply saw that his patrol got from one place to another. The guy in the red beret was pleasant enough, but he seemed to be some kind of a dum-dum. In short, he didn't answer any questions the Scouts asked. Or if he did answer, he said, "I don't know." Scout spirit plummeted. The Scouts had come from councils all over the country. Before leaving home they had agreed to learn all they could about leadership and Scoutcraft skills and, furthermore, they expected to return to their districts and councils and help train other Scouts. Primed as they were for a little excitement and adventure, those first few hours were a drag. More than a few wished they had never come to Philmont. During this period of time there were hurdles: meals needed to be prepared, someone had to cook, and someone had to wash the dishes. Although the Scouts did not realize it, the first stage of the training had begun. Deliberately the patrols had been formed and put into leaderless positions. Deliberately the guys in the red berets had been instructed not to give answers. Deliberately the Scouts had been permitted to struggle without anyone telling them what to do. 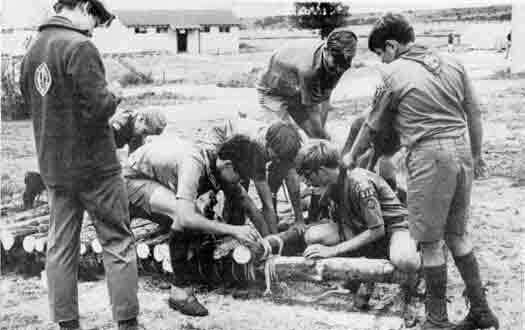 In other words, from the start of the training the Scouts were entrusted with as much of the operation as they could handle. Given a hurdle to walk three feet above the river, the patrol builds a bridge. The Leadership Corp staff member evaluates how well they use the leadership competencies and both get the job done and keep the group together. It's important for the reader to understand now that throughout the entire training period the staff would not exercise heavy-handed control. It was necessary, more so in the beginning than later, to feed certain information or knowledge to the Scouts. The Scouts were encouraged to use this knowledge to develop skill in planning their patrol's activities and in making decisions that would affect the patrol. Naturally, there were mistakes. But the planning, the decision making and the mistakes all contributed to each individual's skill and to his attitude toward himself, the patrol and to the training experience. With this quick explanation of the staff's role, let's jump to the supper of the first day. Once chow was eaten and dishes washed, the fellows in the red berets--they were identified as members of the troop's Leadership Corps, and the Scouts called them LC's--sat down to talk with the patrols about the leaderless situation they had found themselves in earlier. What did the Scouts want to do about it? Invariably the response was "We want to elect a patrol leader" or "We think we need a patrol leader." "This [response] was quite significant," John Larson, the National Council's director of leadership development, explained to me, "because leadership always has been imposed on this age group. They assume it's going to be there and take it for granted. So, by giving them this opportunity to be leaderless we have exposed them to what it's like to be without a leader." And, he might have added, the stage was set for the junior leader training to shift into high gear. Once a patrol makes up its mind that it needs a patrol leader, the LC curiously turns the members away from conducting an immediate election. "There's no hurry," he says. "Why go off half-cocked?" And the LC guides the members through a discussion. He cautions them not to elect a patrol leader on the basis of superficial criteria: the biggest guy, the loudest talker. Instead of running a popularity contest, the LC suggests, why not try to find out something about one another before voting for patrol leader. So each Scout talks about himself; he lists the things he can and cannot do; he discusses what he likes to do and what he doesn't like to do. By the time the patrol elects a leader--the job is temporary, so everyone gets a crack at it before the training is over--each Individual knows the resources of his own patrol. That is, each Scout has a good idea of the skill and knowledge of every other patrol member. One guy may be a good cook. Another may be an expert in lashing. A third may be an expert with an ax and bowsaw. The resources of the patrol are the total contributions that all members can give. Knowing the resources of the patrol is only one of eight "leadership competencies" the Scouts learn during the first week. These eight leadership competencies are the heart of what, from now on, we will call the new junior leader training. And I suppose now is as good a time as any to reveal that the new junior leader training does not revolve around Scouting skills. "The new junior leader training," explains Jack Keeton, "emphasizes leadership--not Scoutcraft." This shift in emphasis does not signal an abandonment of traditional skills or, for that matter, a de-emphasis of the skills themselves. But the shift does recognize that only Scouts of First Class and higher rank are permitted to take junior leader training. And First Class Scouts already have acquired most of the traditional skills. For example, instead of learning more about signaling, the new junior leader training stresses a leadership competency called Getting and Giving Information--or GGI, for short. Let's imagine we are at the end of the first day and the patrol has just elected a patrol leader who will serve for the next 24 hours. New patrol leaders are sent by the LC to a troop leaders' council where each is given information on what is going to happen in the next 12 hours or so. He is told that the only communication with the patrol--especially in regard to daily schedules--will be through the patrol leader. This deliberate maneuver by the training staff reinforces the position of the patrol leader as the patrol's resource on information. If the patrol leader fails at GGI--getting and giving information--the patrol is in trouble. Each day the patrol faces new hurdles as it learns new leadership competencies. Many of these hurdles are exercises in problem solving. A patrol might be told to walk 3 feet above the water" or "build a fire 8 feet above ground." Whoever is patrol leader should be able to determine that what is needed is a bridge--in the case of the first hurdle--and a tower. But the patrol leader has a second perhaps more important, task: he must review the resources of the patrol and decide which patrol member should direct the building of the bridge and/or tower. By appointing a knowledgeable rank-and-file member to use a specific skill in directing a patrol activity, the PL momentarily has stepped aside in favor of one of the group who knows more about the task than he does. The patrol leader has in other words, "shared leadership'--another of the leadership competencies. So far we have mentioned three of these competencies--sharing leadership, getting and giving information and knowing the resources of the patrol. The other competencies learned by Scouts taking the new junior leader training at Philmont were: representing the patrol, planning, evaluating, controlling group performance and how to be a manager of learning. If these last two--controlling performance and managing learning kind of stick in your craw, then welcome to the club. As an old Scoutmaster, I had difficulty in swallowing these last two until I discovered that these competencies really don't imply what they seem to. I cooled down when John Larson, who wrote the syllabus for the new junior leader training, explained. Controlling group performance, he said, is merely Coordinating the work of a patrol to get a job done. A manager of learning--a patrol leader here is one who helps others learn. "The role of the leader," added Larson, "is to get the job done in such a way that he maintains his patrol, or group. By using resources of the group the leader can get a job done. By using the talent of the patrol, he maintains the members' interest and enthusiasm. And, by planning properly, everyone and stands what's to be done, how it's to be done, and (each patrol member) can work constructively to get it done." Basically, that's what the new junior leader training is all about to produce leaders who get a job done while using the members' talents and, simultaneously, keeping the members happy or contented. 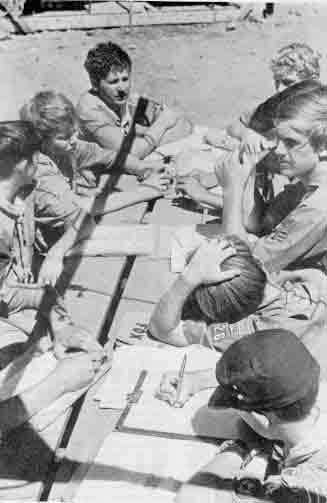 And more than 600 Scouts from all sections of the country were trained--perhaps learned would be a better word--in this method of leadership at Philmont. The syllabus--much revised as a result of the Philmont experiment--will be used this summer of 1972 at National Junior Leader Instructor Training Camps at Philmont and at Schiff Scout Reservation near Mendham, N.J. And future junior leader training at the council and district levels will be influenced by the miracle on Maxwell Mesa. Well, it was a boy developing into a potential leader. It was a boy failing--yes, there were many failures--and laughing and learning because of his mistakes. The miracle was knowledge gained and skills developed and attitudes spawned. The miracle was the smile on the face of a Scout who suddenly realizes that what he has learned will serve him not only in his troop but in school and in church and in the life that lies ahead. The junior leader training experiment you have just read about was made possible through a grant from the Rockefeller Brothers Fund. Additional funds were made available for pilot projects at Schiff Scout Reservation and Philmont Scout Ranch and Explorer Base in 1972 and for later use in local councils.